Joan Schrouder enjoys teaching knitters to reason out solutions. Intriguing construction details, seamless knitting and ethnic styles fascinate her. Joan is a retired registered nurse who has a passion for knitting and people. 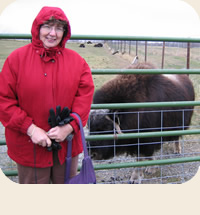 Joan is very personable and has a large following of knitters and friends who enjoy the shared travel experience. Given Joan's classes sell out quickly at national conventions, this unique opportunity to cruise with her will not only be educationally rewarding but will be a lot of fun. Joan is interesting, loves cruising and knows these ports well. Joan Schrouder has been teaching knitting since the mid seventies. She teaches classes at conventions such as Stitches and TKGA, plus travels the country teaching for guilds and yarn shops. Joan's classes often sell out months in advance. Joan also answers technique questions on various internet knitting lists, and her designs have been featured in numerous knitting magazines and has designed for many yarn companies. Unique construction techniques intrigue her the most, especially seamless methods. She has studied with Elizabeth Zimmerman, Meg Swanson and many other noted knitting gurus. Joan is a native Oregonian who lives in Eugene with her husband; she has two adult sons. Some of Joan's favorite books include: Principals of Knitting, Montsey Stanley's Handknitter's Handbook, Vogue Knitting, all of Barbara Walker's books and anything written by Elizabeth Zimmermann and Meg Swansen.